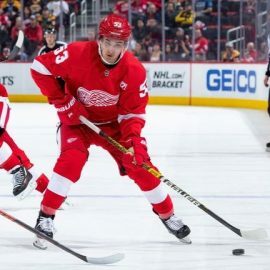 MSU hockey coach Danton Cole once described Hirose as “Datsyukian” – meaning comparable to that of former Detroit Red Wings star Pavel Datsyuk, whose display of silky, effortless moves left opposing skaters undressed, seemingly in disbelief of what had just happened to them on the ice. “I always loved Datsyuk growing up, but I don’t think anyone could be like he was,” Hirose laughed. So, if you followed Michigan State’s hockey’s season this year – heck, even if you just read the stats in the two paragraphs above – it should be no surprise that Hirose opened eyes with an excellent start to his NHL career shortly after signing, recording an assist in each of his first five games with Detroit. Hirose’s last goal had come for the Spartans against Wisconsin on Feb. 2. “I thought (Hirose) did a really good job when he first got here,” Detroit coach Jeff Blashill said. “One of the best things he has at his disposal is that he is able to create plays without tons of risk. You judge players on their positive plays versus their negative plays. He was creating lots of positive plays, but the last couple of games the negative plays started to build back up. Red Wings star Dylan Larkin – who many speculate will be named the team’s captain for next season – recognized the impressive start to Hirose’s career and thinks he can do more. “He’s really consistent and he showed what he could do game after game for us,” Larkin said. “He’s a smart player and he always looks to make plays, and I think next year we are going to need him to come in and he proved himself in a good test of how he played down this stretch. Hirose clearly made a positive first impression, But he knows nothing will be guaranteed going forward. He will have to get bigger, stronger and more durable. He’ll have plenty of competition in the battle for a roster spot next season. Looking at the Red Wings’ potential roster for next season, there several obstacles for him. First, he would have to prove himself against the other young players the Red Wings have accumulated the past few seasons. Players such as Michael Rasmussen and Filip Zadina – the Red Wings’ two prior first-round picks – as well as Jacob De La Rose, Christoffer Ehn and Ryan Kuffner. Then there is the possibility of another elite-level forward being added to the mix when the franchise selects at No. 6 pick overall in this June’s draft. Hirose’s chances will also be affected by who the organization signs in free agency or what players may leave.